So you’re ready to buy a pillow but not sure where to start? No need to worry, you’re on the perfect page for that exact problem. This comprehensive guide has been crafted by sleep experts to help you navigate the plush world of pillow purchasing. If you’re looking for a new pillow, you may wonder whether it is better to buy it in an actual store or to shop online. Going into a store is great because you get to feel the softness/firmness levels of each pillow on display to compare and contrast. But the real test comes at home, on your bed, night after night. That’s why our Nectar memory foam pillow ships free to your door and comes with a risk-free, 50-night trial so you can be sure it’s loft and support fit your sleep style. Nobody wants to feel like they are sleeping on an old, lumpy, bag of rocks, which is what it can feel like if your pillow is really old! If it’s been a long time since you’ve upgraded your pillow, you may notice that the quality of your old reliable pillow is quickly heading downhill and becoming more of a pain in the neck (get it?) than you bargained for. When you feel the lumps and clumps in your pillow, you know it’s time for something new. One of the most telling signs that you need to make a change is if you are consistently waking up with upper back, shoulder, or neck pain. The solution may be as simple as finding a pillow that is more suited for your favorite sleeping position. Look into finding a pillow that will help to support and cradle your head and relieve pressure and that also fits with your sleep position preferences. Once you find the right match your neck and shoulders will be thanking you. Not sure your sleeping position? Check out our handy guide here. If you’re in the process of making a major life change, you might want to go all in with the newness. Moving into a new home might mean that it’s time to upgrade other essentials, which could include purchasing a comfy new pillow. One of the biggest reasons that people are interested in buying a new pillow is that they have decided that it’s time for a new mattress. Having a high quality mattress is a game changer when it comes to improving your overall well being. If you’re sleeping better throughout the night you’ll be likely to have more energy, be in a better mood, and feel more capable of handling day-to-day stress. Often times down is a pillow filling that tends to be avoided by people with concerns about allergies, but new technologies have been making types of hypoallergenic down in order to decrease this problem. Another problem with down, however, has been cropping up in recent news stories and is a bit more shocking than pillows that might make you sneeze. A 2016 article from www.cbsnews.com reported the practice of “live plucking” in order to harvest the highest grade of down. According to the article, live-plucking is, “when feathers and the undercoating of geese and ducks are pulled off their skin while the waterfowl is still alive.” When it comes to purchasing down, this may be a scary hidden cost and harmful practice to animals that consumers don’t even realize. Finally, down doesn’t offer any of the cooling or breathable benefits of new fabrics like Tencel, nor does it offer the contouring perk of a memory foam pillow. What if you discovered a pillow technology that exists to ensure that you’re always sleeping on the cool side of the pillow. Well, Nectar pillows are just that. Nectar pillows are specially designed with Tencel cooling fabric and active ventilation to keep you the perfect temperature throughout the night. Choosing natural versus synthetic fill for your pillow all depends on the kind of support you’re looking for. According to sleep experts, pillows with a natural fill are best if you’re wanting something to conform to your head like a soft cloud or like to ball up your pillow while you sleep. Synthetic fills, on the other hand, are if you want a little bit of resistance and more support, but overall a soft feel. And then there are pillows made with memory foam, which are made to be extremely supportive and more dense. Choose a memory foam pillow if you want something that can contour to the shape of your head, neck, and shoulders, for your best rest. Our pillows get a lot of wear and tear since we spend about a third of our lives sleeping on them. With something that gets that much use and something that you’ve likely spent a decent amount of money on, it’s important to consider how best to take care of your pillows. Similar to how you would take care of and wash your clothes, it’s important to read the tags and labels to know exactly what kind of care your pillow may need. Many kinds of pillows are machine washable, but some need to be taken to the dry cleaners. If you are going to stick it in the washing machine, be sure to put it on a gentle cycle with a mild detergent. Make sure that the detergent is completely off after washing, or put it through on a rinse cycle to ensure that there is no leftover soap. Drying may take up to 4 hours on a low heat. Some people recommend tossing in a couple of tennis balls into the dryer with your pillow to help it get back to full fluffiness. Once the pillow is fully fluffy with no lumps, you’ll know that it is completely dry. This is important because if it is not completely dry it may get moldy. Sound like a lot of work? We agree. With the Nectar pillow, washing is much simpler than this. To clean the Nectar pillow, you can spot clean using mild soap and water and then let it air dry. No need for the hassle and time it takes for machine washing or dry cleaning. Looking into how a pillow is built before you buy it is important when considering what kind of pillow you want. The basic build of a pillow consists of a filler that is encased in a fabric cover or shell. Common covers (or sometimes called slips) are made of cotton, silk, or a mixture of different synthetic fabrics. Less common and more on the ‘fancy’ side are pillow shams, which are closed on all sides but have a slit in the back where the pillow is placed inside. Common fillers for pillows are down, cotton, or memory foam. What filler is best for you depends on what kind of sleeper you are and what kind of support you prefer. Generally if you want something on the softer, more cloud-like side, down is your best bet. If you’re looking for a pillow that is a nice mixture between firmness and softness, something with a synthetic fill will be a good match. If firmness is what you need with less density, you’ll want a memory foam fill. With the Nectar pillow, you’re getting something unique in terms of construction and firmness because we combine the best of all worlds that combines perfect support for every type of sleeping. One of the defining features about the Nectar pillow is that it is a pillow in pillow design. The inner pillow is what maintains support with plush, contouring memory foam, but the outer pillow is where you can control the fluffiness. Nectar pillows come over stuffed so you can decide exactly how much stuffing you’d like. You can even switch it up night after night if you’d prefer. It’s a super soft and super supportive pillow wrapped up in one. Depending on what size bed you have you may want to consider different options or combinations of pillows and pillow sizes. Mix it up with some larger pillows and smaller ones to accent, or keep it simple with pillows of the same size. Whichever you prefer, it all depends on your unique needs – but the Nectar pillow is a great place to start. Our patented Nectar mattress is proved to us that memory foam is an excellent material to support the body while sleeping when compared to feathers or fibers. Customers loved our multi-layered memory foam mattress so much, we decided to make a pillow with it. More supportive than the old-fashioned feather pillows, we made the Nectar pillow with three types of premium foam. Notably our visco-elastic memory foam provides the perfect contour and comfort while the dunlop latex provides the rebound to perfectly support your body. One size definitely doesn’t fit all when it comes to your pillow purchase either, which is why the Nectar pillow comes overstuffed. Just take out the foam until it matches your preferred level of fluff. Make sure to hang on to that extra foam, too, just in case you’d like it more firm at some point down the line. We believe adjust to your personal level of comfort. TRY THE Nectar PILLOW - RISK FREE! You’re next question may be something along the lines of, “What if I don’t like the pillow after it comes in the mail? I’ve had no way to test it out beforehand.” No need to worry. When you purchase a Nectar pillow you have 30 days to send the pillow back (90 days if the pillow is unopened) if you decide that it is not the exact pillow you’re looking for. Plus there is a warranty on the pillow if there is something wrong with the construction or quality. We know you’ll love our pillow, but if not, you’re free to send it back at no additional cost. Pretty cool, right? You also have 30 days for free returns if you purchase your Nectar mattress and decide that it’s not the right fit for you. We understand that you need to try it out when purchasing pillows online, which is why we have this extended return period. If you decide to return the pillows unopened, the return period is extended even further to 90 days. Finding the right pillow starts with asking yourself a few questions. What position do you tend to sleep in? Are you concerned about allergies? Do you generally like your pillows on the firmer or softer side? Softer pillows tend to be best for those who like to sleep on their stomachs. 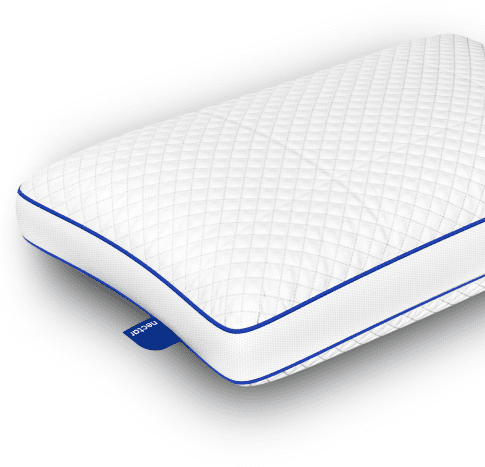 Medium firmness pillows are best for those who like to sleep on their backs, and the firmer, more dense pillows are good for those who need more neck support when they sleep on their sides. These are general rules to follow but really it all comes back to what style of pillow you find most comfortable. That’s why Nectar pillow-in-pillow design with adjustable comfort is a great option if you don’t know what pillow is right for you. Is it better for you to sleep without a pillow? Studies show that it is ideal for your spine to be in the most natural position possible. This means that sleeping on your stomach, especially with a pillow under your head is not as supportive for your back. Sleeping on your side can be better, as long as you have a pillow that is supportive and keeping your neck in alignment with the rest of your spine. This may also be a position where having another pillow between your knees or under the side of your torso may be helpful to keep your spine in alignment. When sleeping on your back, it’s best to sleep with a pillow that is as flat and close to the natural curvature of your spine as possible. Yes! Cooling pillows do wonders to help keep your pillow perpetually on the cool side. Nectar pillows use a Tencel cooling fabric with active ventilation so it feels as if you truly are always on the cool side even if you flip your pillow. How should you sleep on a pillow? How you should sleep on a pillow all depends on the sleeping position that you prefer. Besides just sleeping with your pillow under you head, it is also a good idea to use extra pillows as pressure-relieving support. If you sleep on your side it’s best to use a pillow that is firmer for under your head, and also to stick a pillow between your knees to relieve the pressure between your joints. If you’re sleeping in your back, having a pillow that is medium firmness and placing another, supporting pillow under your knees can help to keep your spine in proper alignment. Memory foam pillows are a great solution for any sleeper. These pillows are specifically designed to contour to your body’s unique curves, which offers the best support all around. If you are having any pain associated with sleeping, you should consider seeking the help of a doctor or chiropractor.